Bicycling, to include snow biking and the use of fatbikes, permitted from four corners (log cabin) around perimeter of Boreas Ponds to White Lily Pond and continuing on and back to four corners. Snowmobiling permitted on same route. Electric motors permitted on Boreas ponds. The opportunity to hunt fish and trap under the current rules and regulations of the NYS DEC. Hunting and trapping promote the principles of sound management for the forest as well as wildlife. All area to the West of Gulf Brook Road and within this bicycling enclosure to the West and South to be classified Wild Forest with the exception of that area around where the Lodge is located and where the log cabin is located which will be intensive use or administrative and in the case of the log cabin, possibly historical. 6-10 car parking lot at site where lodge is located or close proximity to the pond, with a minimum of 4 designated CP3. Overflow area will be at a parking area to be established at or near the log cabin. Snowmobiling permitted along Gulf Brook Road and to the west at the 4 corners log cabin site. Bicycling and horse back riding permitted on this road as well. Development of groomed cross-country skiing trails and snowshoeing trails. Development of camping sites along these trails. Hut to hut/yurts sites to be developed at sites to include the log cabin area and the lodge area. 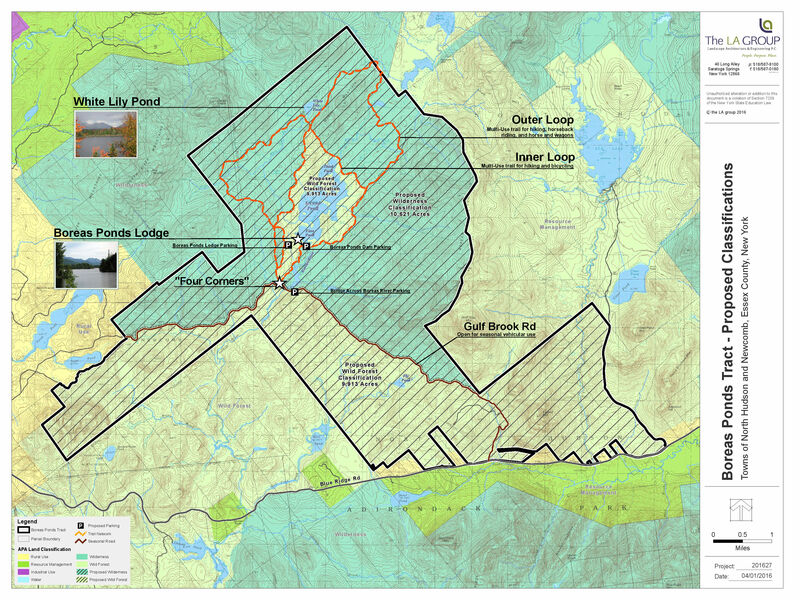 Development of trails to Allen Mt. And Marcy Trail. Provisions to allow for potential future events utilizing established road infrastructure to include, but not limited to, bicycle races, cross country marathon, dogsledding race, etc. The hope would be to route these competitive events through each of the 5 Towns i.e. Beginning at the Boreas Ponds along the proposed snowmobile trail to Minerva, Indian lake, Newcomb, and ending in Long Lake. Maintenance of grounds around lodge so as to maintain the views of the High Peaks. Seasonal motorized access for hunting and trapping. Bicycling permitted on established road infrastructure.